Practices: Varies by grade. Younger grades are once a week and older grades are 2 or more times per week. 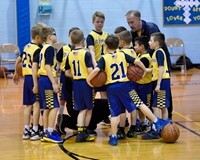 In-house basketball, open to boys and girls in grades 1-2, focus on skills, drills and in-house game play. Teams typically meet once a week, November 1 – mid-February. Boys and girls in grades 3-8, focus on honing their skills and working as a team, while competing against other nearby schools. Practices are typically twice a week, with games on weekends beginning mid-April through mid-May. Teams also have the opportunity to participate in exciting tournaments at the end of the season.